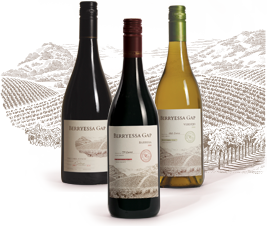 The site of Berryessa Gap Vineyards lies in the gently rolling hills just east of Lake Berryessa. This rich land was formerly known as Coble Ranch and sits below the distinctive break in the nearby hills recognizable to locals as the Berryessa Gap. The Coble Ranch Vineyards flank the California coastal range adjacent to nearby Napa and Solano counties. In 2000, Dan Martinez Jr. and his business partner Santiago Moreno purchased the Coble Ranch and planted grapes on this never before cultivated land. Our winery operations began on Main Street in Winters in 2002. This building now houses our tasting room while the winery moved in 2005 into the former Tufts Ranch warehouse just minutes from downtown Winters. We now also operate a second tasting room at this location. Depending on how you look at it, the Berryessa Gap Winery and tasting room is either the first or last winery you come to when driving on scenic California Highway 128. This beautiful and historic route meanders from Winters past several wineries and orchards on its way to the Navarro River in Mendocino County. The area surrounding the Berryessa Gap winery is some of the best agricultural land in the nation. Located just 30 miles from Sacramento and just 60 miles from San Francsico, Winters is also home to the popular Putah Creek recreational area. Winters’ historic downtown area is like a snapshot of small town America taken in the previous century. The quaint Main Street is home to not only our tasting room but several world class eateries including the original Buckhorn Steakhouse. The highly regarded Palms Playhouse music venue is also located on Main Street.